He says he sent some men to steal weapons for the rebellion. Four of the rebels have been captured. The fate of their leader, Colqui, is unknown. Poma asks Lara to try and Free the Rebels who have been strung up around the lower city, since her disguise will enable her to untie them without arousing suspicion. 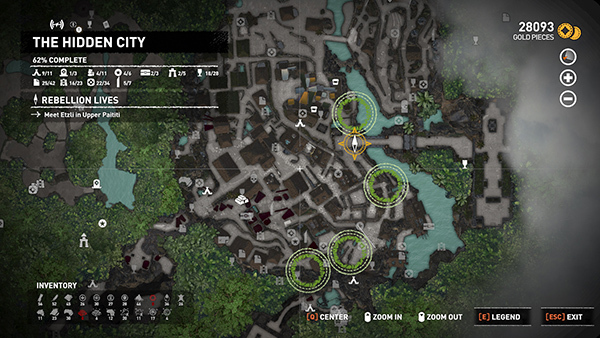 After liberating all 4 rebels, the mission objective is updated: Return to Poma. His location, back in SKULL CAVE, is marked on your map with a green icon. (screenshot) You can either go there on foot or use any base camp to fast travel to the SKULL CAVE Base Camp. As you enter the temple, Poma appears and confesses to Lara that Colqui was actually the traitor and has bribed Poma to change sides as well. Then Colqui himself, dressed in Jaguar Warrior regalia, approaches Poma and cuts him down. "Kukulkan hates outsiders and traitors," he explains. 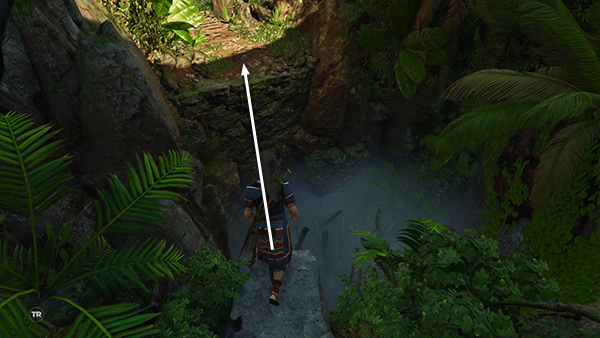 FIGHTING THE JAGUAR WARRIORS: Now Lara must Survive the Ambush. You begin the fight behind a stone table. This offers decent cover, so you may just want to stay here throughout the fight and let the Colqui and his squad of about 18 Jaguar Warriors come to you. They appear a few at a time, so this works well as long as you kill the men quickly as they approach. 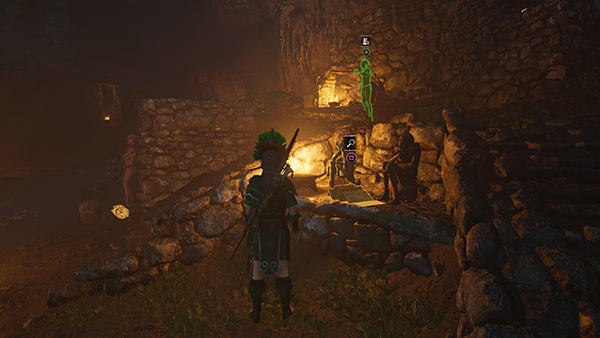 If you hesitate too long, they will surround Lara and you'll have to move or die. NOTE: In the first moments before the enemies approach, you may want to use an Endurance Mixture (press F2 on the keyboard or hold L1/LB on the controller and press Circle/B). You will need to have unlocked the Heart of the Jaguar Skill to do this. Endurance mixtures reduce damage from melee and ranged attacks. When you've defeated Colqui and his men, the mission is complete and you receive a large XP award. Be sure to loot the bodies. Each man carries at least 100 gold pieces, plus feathers and/or health and other herbs. There's also a box of cloth at the foot of the staircase on the right and some arrows leaning against the wall near the back right corner. Then return through the low opening on the north side of the temple and follow the hallway back to the Temple Path Base Camp. †UPDATE HISTORY: 12/9/18 - First draft of walkthrough posted online.